We are one of those couples with furry babies. The sorts of humans that sit listening to other humans regale us with tales of their micro humans getting up to no good, and we manage to always associate it with the behavior of our furry dogs… because well, our dogs think they are people. One day we’ll have a micro human of our own, but for now it feels like the house is full enough. For those who follow Chew Town on Instagram, I do sometimes interrupt the usual transmission of the food feed with a few photos of Honey and Nero but recently I realised that they have never actually appeared on the blog, despite always being underfoot and being my ‘sous chefs’ for Chew Town shoots. 8 year old Honey (poodle x chihuahua) was joined by Nero (Black Miniature Schnauzer) a year ago. Nero is an absolutely terror, both loving and destructive in equal measures, but with a face that looks at you with such cuteness its hard to be angry at him for long. The tiny 8 week pup-pup we travelled 3 hours out of Sydney to collect is now a 6kg food guzzling cutie (see photos above). 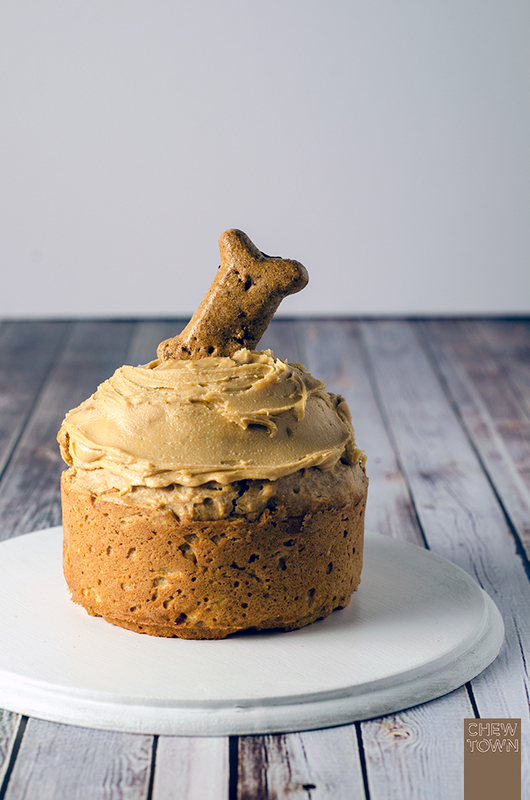 He recently turned one and so to celebrate his birthday I created a very special Peanut Butter and Apple pup-cake for he and Honey to share. Completely motivated by food, capturing shots of Nero with the uneaten cake was near impossible and required the efforts of Scott and I. Grease a 10cm spring form tin and set aside. In a bowl combine all the ingredients (reserving the extra peanut butter for the frosting) and mix well until smooth then pour into the prepared baking tin. Bake for 20 minutes or until a skewer inserted comes out clean. Remove from the oven and set aside to cool. Once cool, 'frost' the top of the cake by spreading it with peanut butter and serve to your dog/s. Always love seeing people’s pets! Somewhere on my blog I have a picture of Kitty Riffs photobombing the set during a shoot. 🙂 Lovely looking dogs. And terrific treat! What cute pups, I just love the first photo with the hungry doggie tongue! They must have been so surprised when they realized that you had made something for them. honey is gorgeous! id like a furry friend too! Your dog is adorable! Now I just feel like it is time to spoil my little pug girl. She will probably swallow this whole! I am in puppy heaven!! Cutest ever. Better watch out – next time I come over, I may sneak them into my handbag! Sharing! When people ask my husband and I if we have kids, I respond we have a dog. So I get you and your little fur babies are adorable! I have a snoozing pug on the couch right now that would go nuts over this pupcake! This is simply too adorable. I think I’d be fighting off the dogs to get my share of this cake! oooh, Nero! #teamMiniSchnauzer My mini schnauzer would lurve this pupcake. We have a black schnauzer called Nero as well! He deserves one of these cakes……….. This is too adrobale! I love your little puppies! Haven’t made a treat for my babies in so long. Definitely trying this recipe! Would LOVE a catch up. I’m flying to Europe tonight for a few weeks, but I’ll get in touch when I’m back. You know I love your fur babies as if they were my own. Can’t believe that Nero is already one. Wow, how time flies. Love how Ms Honey is being all delicate with her piece of cake and Nero has already woofed it down. Awesome pup cake!